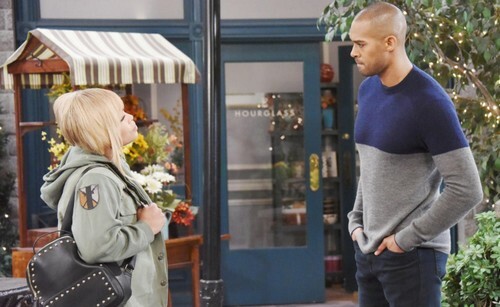 Days of Our Lives (DOOL) spoilers reveal that Sheila (Tionne “T-Boz” Watkins) might be staying for a while longer. Everyone thought she would flee Salem with Bonnie Lockhart (Judi Evans.) However, it seems that isn’t the case. Could she stay in town and cause trouble? On a recent episode, everyone finally discovered the history between Eli Grant (Lamon Archey) and Sheila. They were friends, lovers and the FBI agent was forced to arrest Sheila and her brother, Warren. That is why there was so much tension when Sheila discovered he was in Salem. There is no denying that Eli and Sheila seem to still have some chemistry. Even though he is dating Gabi Hernandez (Camila Banus,) old lovers never really go away forever. This is especially true since he has finally agreed to help his ex-girlfriend. Days of Our Lives spoilers indicate that Sheila might want Eli Back. However, Gabi is in the way. Will she start a war with the Latina fashionista to get what she wants? Remember, Sheila wasn’t one to be crossed in prison. She is confrontational, direct and will do whatever is necessary to get what she wants. What the former felon doesn’t know is that she isn’t the only convict in town. Gabi was in prison, too. Although a sweet person, don’t mess with Gabi, especially when it comes to matters of the heart. Days of Our Lives spoilers imply that Eli will have to do some fancy footwork to protect Sheila. She could face prison time for helping Bonnie Lockhart. He also wants to make it up to her and that could cloud his judgment. She made a choice, but he feels so guilty about the past that he wants to make things right. Unfortunately, this could have severe personal and professional consequences. What do you think is going to happen with Sheila, Eli and Gabi on DOOL? Keep watching the NBC soap and check back with CDL for the latest Days of Our Lives spoilers, news and updates.